This experiment is similar in principle to the project Bet on a Rolling Ball but appeals due to its simplicity: the majority of materials you will need can be found at the local supermarket (the magnets you can of course buy from us :-) ). Hold both carton tubes vertically next to each other (distance approx. 10 cm) or fix them in a stand if you have no helper when performing the experiment. 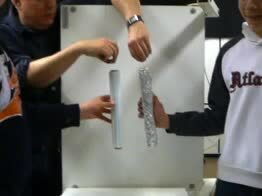 Place a piece of foam or other soft material under the tubes to catch the delicate magnets after the fall. Then hold a magnet sphere over each tube and let the spheres drop at the same time. You will see that the sphere which must fall through the tube covered in aluminum foil needs much more time to "land" than its competitor. If you drop the magnet spheres through two tubes which are mounted at a slant (with the same angle), the difference in speed will be even more pronounced - just as in the experiment "Bet on a Rolling Ball" from Eugen Keller. And no wonder: in both cases the track is made of aluminum. The fact that there is carton between the aluminum and the magnet sphere has only a small influence (somewhat more distance between aluminum and magnet, somewhat more friction due to the carton). This electrical current produces a magnetic field which works in the opposite direction of the falling magnet; the sphere is therefore slowed down. Tip: The effect is even more evident the more layers of aluminum you apply to the tube and the smaller the difference in size between the inner diameter of the tube and the diameter of the sphere. As in the experiement "Bet on a Rolling Ball", you can also compare the time of fall with that of a steel sphere. In this case you will need two tubes covered in aluminum foil.